The second on-site training session for technical staff from biobanks of the German Biobank Alliance (GBA) was held in Heidelberg on 16 June and 10 July. Due to popular demand, Prof. Dr. Esther Herpel, who is head of the NCT Tissue Bank at the BioMaterialBank Heidelberg (BMBH), ran the training session twice. 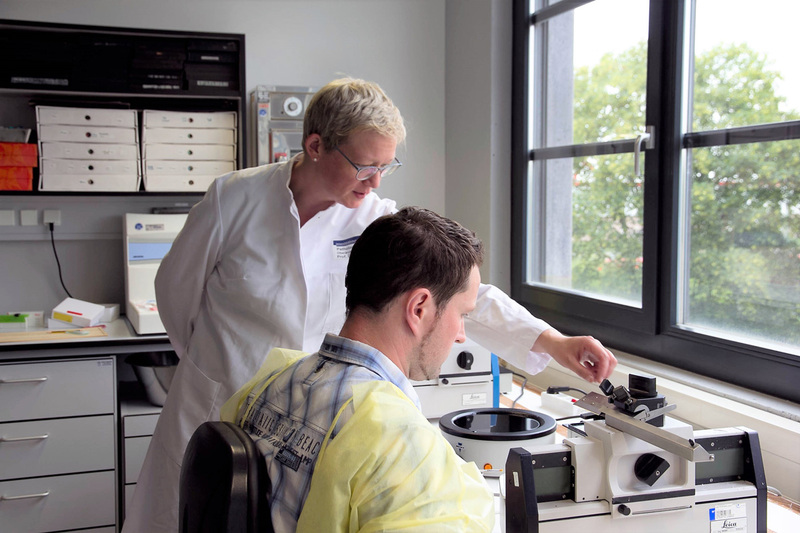 A total of 15 specialists from ten biobanks took part in the further training on tissue sectioning. Esther Herpel began by looking at the theory behind the correct preparation of tissue sections. In the practical session that followed, the participants applied the knowledge acquired and produced high-quality paraffin and tissue sections as well as tissue microarrays. The latter allow the parallel analysis of several thousand individual samples using just a small amount of biological sample material. Depending on their level of knowledge and experience, the participants were then able to focus on just one of the three methods. Held several times a year, the training is part of a large-scale further training programme for the technical staff of biobanks and covers a variety of different topics. With its training and plans for an online training platform for technical assistants, GBN is making a decisive contribution to the harmonisation of procedures within GBA biobanks and thus also to improving the quality of biosamples. This article originally appeared in German on the German Biobank Node website.